The Royal Oak on Owl Lane was also known as "the Barracks" due to it being end of a terrace of 24 back-to-back dwellings, known by the same name. More than likely the terrace got its name from its appearance and, with the exception of the Royal Oak, the row was subsequently demolished, leaving only the Public house standing. 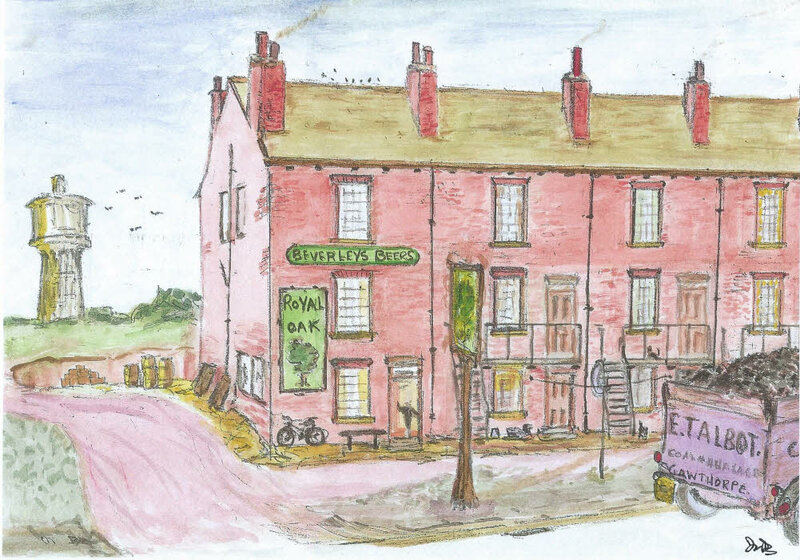 The sketch shows the three storey dwellings in the 1950s when The Royal Oak, first licensed as a beerhouse in the 1870s, was owned by Beverley Beers. It was only in 1964 that The Royal Oak was eventually granted a publican’s full license and this may have coincided with the time of demolition of the remainder of the Barracks dwellings. In 1954, a petition was raised by the miners at the nearby Shaw Cross colliery who requested an extension of closing time to 4 p.m. so that the they could obtain a drink at the end of their day shift. The extension was granted to the then licensee, Francis Joseph Graham. In the sketch, the Gawthorpe Water Tower stands in the left background, while Talbot Coal Dealers of Gawthorpe get on with their coal deliveries.